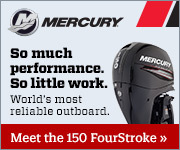 I’m thrilled and honored to have recently be accepted to the Mercury Marine Pro Team staff. Ken Main and staff at Gulf Shores Marina did a great job of rigging my new Mercury 150 Four Stroke. My boat now handles like a sports car with the power the Mercury Four Stroke brings. In addition my new Mercury Enertia Prop jumps my boat out of the hole, grabs on the tightest turns and the entire rig has improved my gas mileage. Thanks Ken & Mercury! Don’t hesitate to call if you’d like a test drive, it’s easy for everybody as I live on the water.